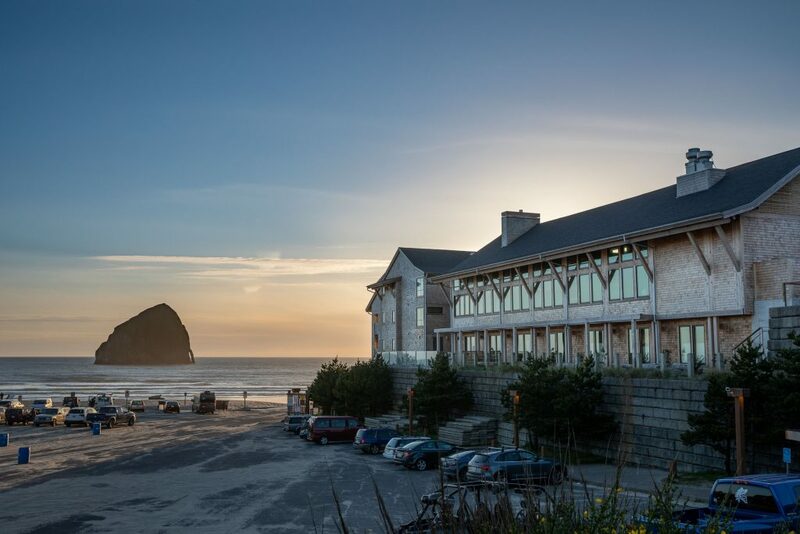 With stunning views of Pacific City’s Haystack Rock, the Headlands Coastal Lodge and Spa was designed with rustic elements while maintaining a sophisticated, classy feel. Just like the Oregon coast itself, Headlands Coastal Lodge and Spa welcomes you whether you’re dressed in jeans and flip flops or looking for an elegant fine dining experience with exquisite views. O’Brien constructed the Lodge in rough winter weather conditions at the heart of the Oregon coast. Guest rooms feature surfboard and mountain bike hooks and soaking tubs. Every room in the Lodge has three panel sliding glass doors which open to views of Haystack Rock. The Lodge entrance features heavy timber beams and extensive use of rustic wood is used throughout the entire space. Touches of Pendleton Wool make this a uniquely Oregon property, through and through. The hallway from the main lobby to guest rooms features a stunning view of Haystack Rock, which is centered in the window down the entire hall. The fireplace mantel in the Meridian Restaurant mirrors Pacific City’s dunes through its height, colors, and textures. Indoor outdoor dining space allows the windowed walls to open and meals to be enjoyed with the sound of waves and a breeze.